On April 5th 2011 I reported that Michel Chryssicopoulos at Chryssicopoulos Yachts had signed Posillipo’s 30.25m Aifos for sale and now he tells me she's sold. Built in 2004 as one of the yard’s Technema 95 series, she sleeps 10 guests in five double staterooms along with five crew. 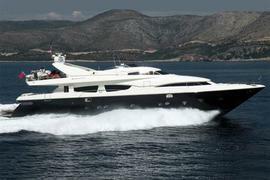 Twin 2770hp MTU engines give Aifos a cruising speed of 27 knots and she was asking €3.3 million.